Confusing timelines, silly Easter eggs, and a surprising ending are the best descriptors of the latest episode of Once Upon A Time. While you may think that this episode gets away from some of the crazier, useless storylines that have been plaguing the back half of the season, it is a little hard to get past the one of the two main plots simply because the timelines don’t match up. Other than that mistake, the episode is pretty decent and probably has my favorite ending this season. A vast majority of the episode focuses on parallel Hook-themed stories in the past and present. In the past, we see Hook trying to free young Alice from the tower that Gothel has her magically trapped in. 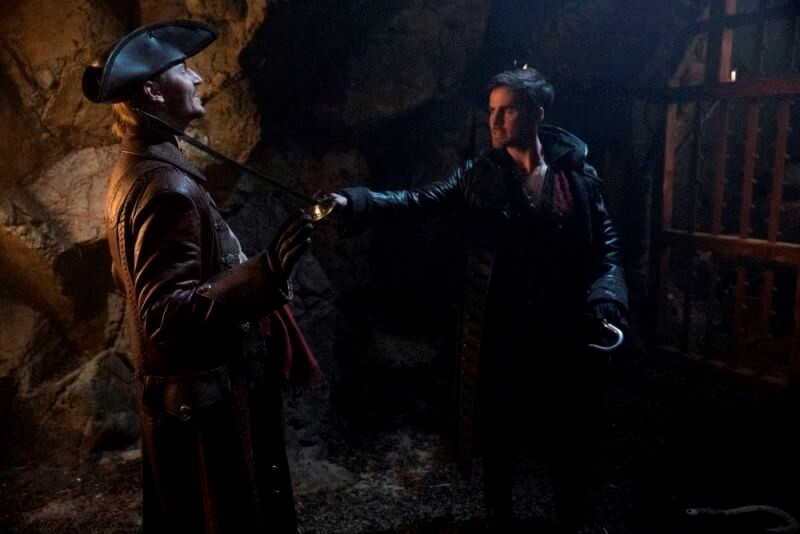 This seems all fine and dandy until Hook decides that there is one option he hasn’t tried yet and goes to find Rumplestiltskin in the old cavernous cage prison. I got pretty confused here because all of the timelines pretty much were flushed down the toilet in one scene. Maybe I can’t figure out what realm they are supposed to be in, but if we are still supposed to be following clone Hook around, shouldn’t he be in the same realm as everyone else? The whole “Rumple being the Dark One and locked away in the magical prison Snow White and Prince Charming kept him” thing is what threw me off. At this point in the series, I try not to overthink these things because no matter how much I do, they never make sense. Time clearly moves at varying rates in this realm. However, it’s so great to finally get a few real Rumple scenes! Robert Carlyle has always been one of the highlights of the show and he is just brilliant at bringing the true fairytale Rumple to life. The creepy, sinister Rumple is just what this show needed — even if it is just for one episode. Hook goes to Rumple to see if he can help him save Alice. Rumple sends him on a quest to find Captain Ahab (snore) who is in possession of Maui’s magical fishhook. Yes, that’s right: Once Upon A Time totally pulled a Moana reference and Colin O’Donoghue (Hook) is practically rolling his eyes while saying the line that mentions it. I had the same reaction, except I was also laughing at how O’Donoghue was presenting the scene. Ahab is useless and just a weird character to introduce. He is young, cocky, and a really terrible character. His only purpose was to try and get under Hook’s skin by calling him soft, to try and pull the old pirate Hook out from the depths of new and improved Hook’s mind. It was all pretty boring but in the end, Gothel prevails over Hook with a poison bullet, steals the fishhook, and leaves Alice trapped in the tower. Now that the boring stuff is out of the way, Hook’s present timeline is starting to heat up. Hook and Rumple are hot on the case of trying to find the person who is killing members of the coven of witches run by Gothel. Of course, Hook still doesn’t know the whole truth, but this is about to change. Gothel comes by the station to “help” — which obviously is something that will only benefit her. It’s a win-win for her to give a helping hand because they might be able to stop her witch friends from dying and she can manipulate Hook a bit more. The mind games she plays are clearly to try and trigger Hook’s memories hidden by the curse. He doesn’t make much progress, but it seems that Gothel intends for a slow burn wake-up call. The end of Rumple and Hook’s story-of-the-week is a bit confusing. They find Tilly (Seattle Alice) at a fresh crime scene with two dead bodies and a bloody scalpel in her hand. While it is not clear if Tilly killed the people or just showed up afterward, she is suffering from another mental breakdown. Unfortunately, we aren’t given the privileged information of whether she is off her meds again, which would indicate that she knows what is going on and is actually trying to take out the coven for a good reason. Tilly runs away, so Hook and Rumple go to her home to see if she is there. They uncover a slab of rock with the coven’s symbol on it, and two of the spokes are crossed out with red paint. Tilly is either killing witches or is being framed, so this could be an interesting case to watch. Another surprising turn of events shows that Drizella might not be totally evil after all. Drizella has spent the week since her mother died trying to figure out who she is without hating her mother — who also secretly loved her. The good news is that it looks like Drizella might be changing for the better. She asks the only good person she knows to help her out with her existential crisis, which might have changed her worldview. Henry is, naturally, a gentleman and tells her all about how to grieve. She tries to make a pass at him, but he rejects her. At the end of the episode, Drizella brings a peace offering of sushi over to Henry’s apartment to thank him for his help. A funny Easter egg shows up here with the number on Henry’s door: 815. She tells Henry that she wants to make up for past mistakes and that it has to start with him. Is this an indicator that she is going to try and fix/break the curse without killing him? Drizella has seemed to have a soft spot for Henry in the Seattle timeline, so maybe there is a happy ending for all in sight after all. If Drizella’s turn toward potential goodness surprised you, then the very end of the episode will be downright shocking. I don’t think anyone saw this one coming but in hindsight, it does make a lot of sense to end the series in a way that pays the ultimate homage to the original concept of the first season. Lucy struggles throughout the episode with the idea that Henry will die if he ever kisses her mom. She is so distraught that she tells Jacinda she doesn’t believe in fairytales anymore and that she doesn’t want her to see Henry ever again. Lucy goes to see Regina at the end of the episode to pick her brain about the stories and the page that magically appeared. Regina pulls the ultimate surprise and tells Lucy that the stories are all real and that she is awake. Lucy is shocked to hear that Regina knows the truth and who she really is, then realizes that Henry is her father — making Regina her grandmother. This is a pretty big character reveal, especially for Lucy. Regina decides that the best way to fix the whole curse situation is to use a blast from the past and pull Lucy onto her side. She starts a new operation with Lucy to save everyone and break the curse. Operation Hyacinth is a go, which means classic Once Upon A Time might be back.